You might use the Manage Connections feature to set up new Direct Import connections, but it also plays an important role in troubleshooting cranky connections. Tap the Settings icon on the budget screen. Locate the connection you want to remove. Tap Remove. Tap Remove again to confirm. Tap the X in the upper right-hand corner to close the Manage Connections window. Removing a connection will not impact your transaction history in your account registers, and it doesn't require you to delete any accounts. It will disconnect all accounts you have connected to that financial institution, but getting those reconnected is easy peasy! Once you've removed the connection, it's time to create a fresh one and reconnect your accounts! Tap the account you'd like to reconnect. Tap on the three dots in the upper right-hand corner of the app. 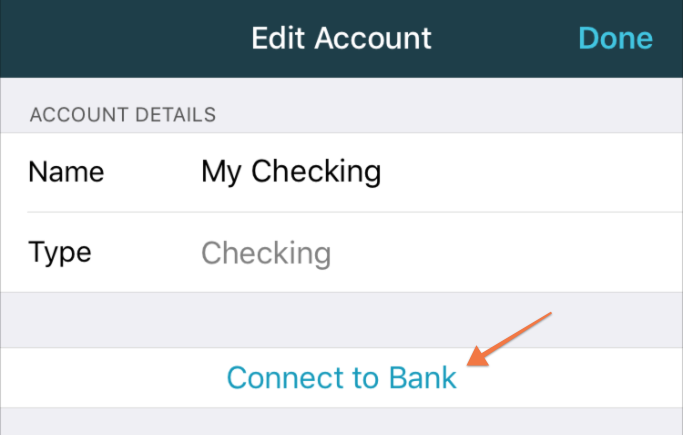 Tap Connect to Bank to choose from your existing connections—or Add New Connection—and follow the prompts. If you have other accounts associated with this connection, link those too!